Even with things like Flipboard and Google Play Newsstand, RSS readers still remain popular. Since Google killed the popular Reader service in 2013, RSS readers seem to have grown in popularity and usage. 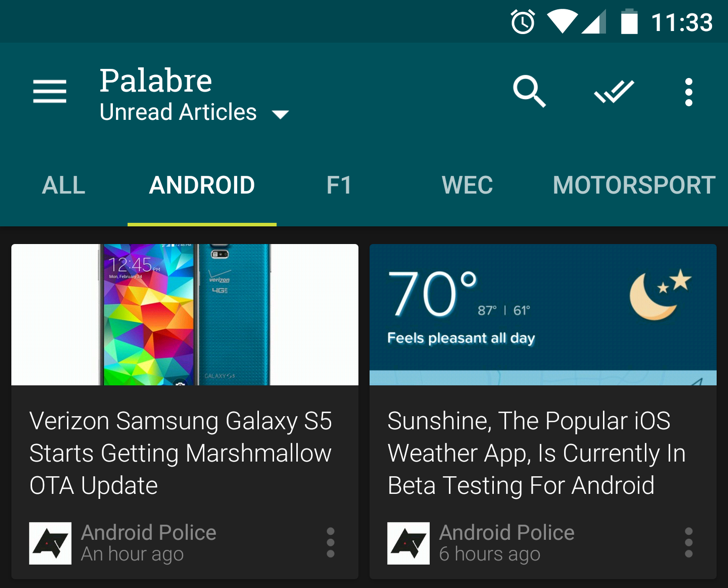 Today one of the major RSS apps available on Android, Palabre, is getting a massive update to version 3.0. 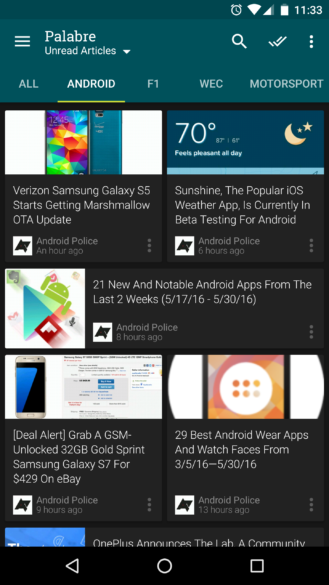 Right: list of articles, arranged in a tile fashion. 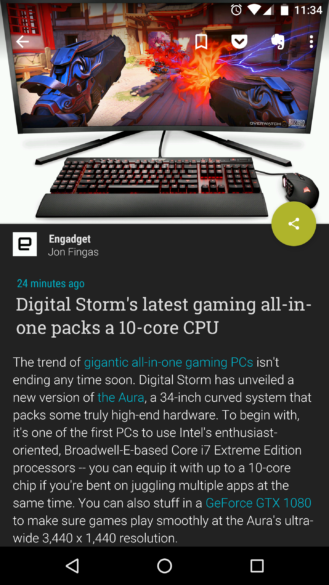 Left: article view. When scrolled the options on the app bar disappear. Maybe the most important new feature is keyword muting, meaning you can stop seeing articles with that specific keyword (say you didn't want to be spoiled about a TV show or sports game). Similarly, keyword alert will notify you of any articles using that particular keyword. For users who've purchased Palabre Premium, the app can be themed, modifying the primary and accent colors, as well as the overall theme (choosing between white, dark, and black). Other new features include text-to-speech, enabling a virtual reading of the news, and a history function to see which articles you've read. Login is available through either Feedly or RSS (selecting the sites you'd like to subscribe to), plus there are plugin apps for InoReader, The Old Reader, Flickr, or Twitter. The update is out on the Play Store now, so go grab it. An in-app purchase of $2.50 is available for Palabre Premium.